yoana is using Smore newsletters to spread the word online. Beliefs are important in Buddhism. The religion's important doctrines aren't necessarily the same as those of other world religions, for example they don't have doctrines about God like Judaism, Christianity, and Islam do, but nevertheless beliefs are still central to the Buddhist worldview. Shortly after the Buddha's death, or Parinirvana, his closest disciples gathered to recall and recite all of the master's spoken teachings, by way of approving and codifying those sutras which they determined to be authentic. The sutras were not written down at first but were passed along in oral form for several hundred years, and so in the written form each sutra typically begins with the phrase, "Thus have I heard," followed by a description of where and to whom the Buddha was speaking. The original transmissions were reportedly in as many as five early tongues including Sanskrit, the classical language of India, and Magadhi, which the Buddha spoke. When the texts crystallized, they were in two main bodies, the Pali Canon of the southern Theravada tradition and the Sanskrit of the northern Mahayana tradition (written c.125-150). The original sutras were divided into five collections known as nikayas, from the Pali word for "corpus." These five nikayas make up the pitaka or "basket" called the Sutra-pitaka. The fifth, Khuddaka nikaya, for instance, contains the famous Dhammapada ("Virtue-path"), 426 pithy verses of the Buddha's basic teachings, especially popular today in Theravadin countries. The same nikaya also houses the Theri-gatha, or songs of the female elders, some of the earliest enlightened women in Buddhism. The Buddha's most celebrated utterances are scattered throughout the sutras, such as his "Fire Sermon," which T. S. Eliot used as a major source for Part III of "The Waste Land." The Sutra-pitaka, together with the Vinaya-pitaka (accounts of the origins of the first Buddhist community and the rules for monks and nuns) and the Abhidharma-pitaka (Buddhist psychology and philosophy), make up the Tripitaka, or "Three Baskets." This is the Pali canon of Southern Buddhist scriptures, and is paralleled by the even more extensive Northern Buddhist canon, which was probably written down later than the Pali canon but originated at about the same time. 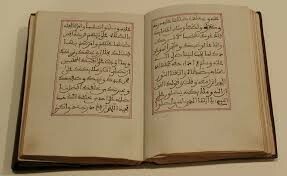 Most of the scriptures have never been fully translated into English, which is understandable when we consider that no other tradition on earth has created a larger body of sacred texts. To take one example, the 40 sutras known collectively as the Prajnaparamita Sutra take up, in their Tibetan block print editions, 100 volumes of about 1,000 pages each. Set down in writing somewhat later than the Tripitaka, this sutra is believed by Western scholars to reflect elaborations on the words of the Buddha by Indian Buddhists beginning about 100 B.C.E., and as late as Nagarjuna. 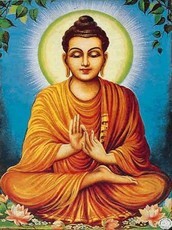 Mahayana Buddhist scholars, on the other hand, believe that the Sutra records the actual words of the Buddha, but that the texts were removed from the human realm by gods and dragons for 400 years to allow time for the renunciative, monastic life to purify and prepare people for the messianic nature of its teachings. Over the centuries, abridged versions of this great sutra have appeared, from the extremely short One Letter Sutra (its text is the letter A) to versions of 8,000, 18,000, 20,000, and 25,000 lines. In its original form, called the "Great Mother," it purports to be a complete record of Shakyamuni's audience on Vulture Peak Mountain, in which the Buddha states that he is only the latest of a line of avataric predecessors, and constantly asserts that Prajnaparamita -- the female embodiment of the Sutra -- produced all the Buddhas and is their mother and instructor. 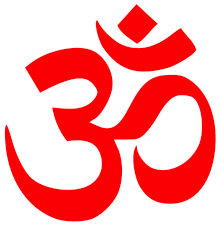 It also gives us the classic Buddhist mantra, Om mani padme hum, and predicts the coming of Maitreya (Skt. "Loving One"), the Buddha-to-be who waits to emanate at some time in the future to help any who have not yet realized enlightenment. Besides the sutras, the Mahayana canon contains many shastras, treatises that interpret and comment on the philosophical statements contained in the sutras. Most Buddhist sects are based on one or another sutra. For example, followers of the Japanese sect of Nichiren Buddhism chant their faith in the Sutra of the Lotus of the Wonderful Law, or Lotus Sutra, a key sutra of Mahayana Buddhism. The Chinese school of T'ien-t'ai ("School of the Celestial Platform") also bases its doctrine on the Lotus Sutra. One of the most often quoted scriptures is a small section of the Prajnaparamita known popularly as the Diamond Sutra, a name that implies the penetration of the most impenetrable wisdom. Translated into Chinese in the year 401, the Diamond Sutra later became the first book ever printed (in 868), more than five centuries before the Gutenberg Bible. The Bardo Thodol gives very specific, detailed accounts of the journey from death to rebirth, dividing it into three distinct stages: The Chikhai, Chonyid, and Sidpa Bardos. Remarkable correlations between the first stage described in the text and modern accounts of near-death experiences have been catalogued in Raymond Moody's popular book, Life After Life. Although worshipping in a temple is not essential for worship, Buddhists do visit shrines and temples to pay their respects to Buddha and to meditate with other Buddhists. Going to a worship space is not essential because Buddhism is a way of life, a way to act all of the time. Some Buddhists also have shrines in their homes, allowing practitioners to pray at the most convenient times for them. Buddhist shrines and temples take many different forms depending on where they are built. The first Buddhist shrines were ten dome-shaped mounds, or studpas, which were built to hold Buddha's ashes. Then more stupas were built to hold sacred items. Some stupas are bell-shaped. Visitors walk around the stupas as a way of paying their respects to the Buddha. In Japan and China, Buddhists built pagodas as sacred temples. These are towers with various numbers of tiers, usually five. The five tiers represent the five basic elements of the Universe -- earth, water, fire, wind, and emptiness. The height represents reaching out of the physical world towards wisdom. Buddhists go on pilgrimages to places associated with Buddha's life. These places include his birthplace, Lumbini Grove, the place of enlightenment, Bodh Gaya, the place of his first sermon, Sarnarth, and the place he died, Kusinara. In addition there are other sacred places, special to the various branches of Buddhism. For example, since the Dalai Lama, the spiritual leader of Tibetan Buddhism, was exiled from Tibet when the Chinese army invaded in 1959, he has been livng in Dharamsala, India. This has become a special place for his followers who go there to study and hope for an audience with the Dalai Lama. Some Buddhists want to practice Buddhism more strictly and with less distraction. These monks and nuns form communities and live in monasteries. A religious community of Buddhists is called a Sangha. In some countries, young boys and girls spend part of their education living as monks. Buddhists use monasteries as places of refuge for meditation and to refocus on a simpler, less worldly life. Monasteries are important places to Buddhists. Other important types of symbolism in Buddhism include colors, especially the five colors of white, yellow, red, blue and green, and symbolic hand gestures called mudras. The articles in this section explore these Buddhist symbols, providing information on their history, meaning and use in Buddhism today. (For an introduction and quick guide to Buddhist colors, see our Chart of Buddhist Color Symbolism. The Buddhist New Year. The New Year is on different days for all kinds of Buddhism. 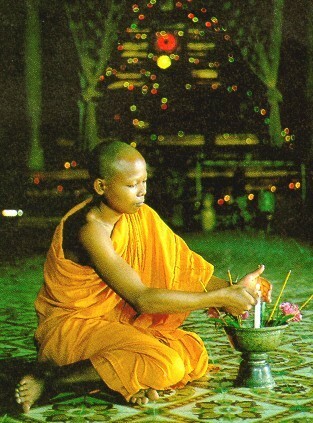 In Theravadin countries, the new year is celebrated for three days, starting on the first full moon in April. In Mahayana countries the new year starts on the first full moon of January. For Tibeatan Buddhists the new year is usually sometime in March. Dhamma Day. Dhamma Day is on the full moon of the eighth month (July). This holiday is to commemorate the Buddah's first sermon. Elephant Festival. Elephant Festival is celebrated by Thai Buddhists on the third saturday in November. Buddah used to use the example of a trained wild elephant to teach his followers that new Buddhists should look up to the older Buddhists for help. Ancestor Day (Ulambana). In Mahayana countries, it's believed on the first day of the eighth month ghosts come visit the world for 15 days. During the first 14 days food offerings are made to relieve the suffering ghosts. On the fifteenth day people visit cemeteries to make offerings to the people. Veska (Buddha Day). Veska is on the birthday of the Buddha and is by far the most important Buddhist holiday. 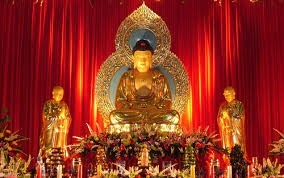 All Buddhists celebrate the birth, enlightenment and death of Buddha in one day. It happens on the first full moon day in May, and it's called Veska because it's the Indian name of the month. While estimates vary between 200-500 million adherents, the generally agreed number of Buddhists is estimated at around 350 million (6% of the world's population). This makes Buddhism the world's fourth largest (in terms of number of adherents) religion.